THE SOCIETY OF BIBLICAL LITERATURE has posted the full text of a new book online for free. For you, special deal! In Invention of the First-Century Synagogue, Lidia D. Matassa critically reevaluates the scholarship surrounding the identification of firsrst-century synagogues at five key sites: Delos, Jericho, Herodium, Masada, and Gamla. These sites are consistently used in modern scholarship as comparators for all other early synagogues. Matassa reviews the scholarly discourse concerning each site, inspects each site, and examines the excavation reports in conjunction with a thorough analysis of the literary and epigraphic evidence. She uncovers misunderstandings of the site remains by previous scholars and concludes that excavators incorrectly identified synagogues at Delos, Jericho, Masada, and Herodium. After a clear review of the material evidence, Matassa concludes that the identification of a synagogue at Gamla may be correct. LIDIA D. MATASSA was an independent scholar and founding president of the Irish Association for the Study of the Ancient Near East. She participated in a number of excavations in Israel and helped organize multiple interdisciplinary conferences in Dublin. She coedited Text, Theology, and Trowel: Recent Research into the Hebrew Bible (2011). Matassa passed away suddenly in January 2016. HT Todd Bolen at the Bible Places Blog. Cross-file under New Book. Also, the work of the late Dr. Matassa was mentioned here. In Delicious Prose: Reading the Tale of Tobit with Food and Drink, Naomi S.S. Jacobs explores how the numerous references to food, drink, and their consumption within The Book of Tobit help tell its story, promote righteous deeds and encourage resistance against a hostile dominant culture. Jacobs’ commentary includes up-to-date analyses of issues of translation, text-criticism, source criticism, redaction criticism, and issues of class and gender. Jacobs situates Tobit within a wide range of ancient writings sacred to Jews and Christians as well as writings and customs from the Ancient Near East, Ugarit, Greece, Rome, including a treasure trove of information about ancient foodways and medicine. H-JUDAIC: TOC: Journal of Jewish Languages 6.2. This issue includes an article on Jewish Neo-Aramaic and another on Judeo-Arabic. THE FRANKEL INSTITUTE ANNUAL, Volume 2018 is now available for free online. How did Jews in the ancient Mediterranean engage, sense, and construct material entities, artifacts, bodies, buildings and more? How did those who were not Jewish perceive or represent the relationships between Jews and matter? How has the history of Jews and matter been reconstructed in modern scholarship and how might scholars approach the nexus of Jews and the material more productively? I noted the book when it was published here. I commented a bit there. I have still not read it, nor do I plan to. This methodological question invites us to note an aberration that the author does not mention, that of language. If the Septuagint really copies the Greek laws in the Greek scholarly milieu of the Great Library of Alexandria, how can one explain why no Greek lexical or stylistic borrowing is in Hebrew? It is indeed in general the Greek translation known as the Septuagint that one credits with “hebraisms," not the opposite. The whole of these points attenuates, it seems to me, the strength of the theory of the author. But read the whole thing, because the reviewer has a lot more to say, both positive and negative. LARRY HURTADO: A Personal Update. Larry has finished his second round of chemotherapy and is recovering at home. Again, all best wishes to him from me and on behalf of PaleoJudaica's readers. FOR YOU, SPECIAL DEAL: Kindle Deals on Second Temple Judaism and the New Testament Backgrounds from Eerdmans (Phil Long, Reading Acts). The special Kindle prices for these books are still on as of this posting. The LXX at AAR/SBL etc. AAR/SBL IS COMING: The Septuagint at the Denver Meetings (John Meade, ETC Blog). The annual meeting of the Society of Biblical Literature and the American Academy of Religion, with various associated meetings, is in Denver late next month. THE AWOL BLOG: Open Access Journal: Bulletin for Biblical Research (BBR). The volumes of this journal from 1991 through 2014 are available online for free. EXHIBITION: Syria’s recovered artifacts go on display in Damascus. Though over 9,000 pieces have been salvaged, Syrian antiquities chief says tens of thousands of antiquities smuggled out of country are still missing (AFP). There is not a lot of detail about the artifacts. But the bust on the far left side of the first picture (the one with the woman taking a selfie) appears in a closeup later in the article. It is from Palmyra. You can see that it has a Greek inscription on the left side and what I would take to be a Palmyrene Aramaic inscription on the right. by Dr Melonie Schmierer-Lee. On Wed, October 17, 2018, 5:00 PM – 6:00 PM BST, in the Cambridge University Library. Our speaker, Renée Levine Melammed, is a Professor of Jewish history at the Schechter Institute, Israel. Her current research focuses on women's lives as reflected in the Cairo Genizah. For a thousand years the Jewish community of Old Cairo put their worn-out writings into a synagogue storage room, a genizah, and this collection is now one of the treasures of the University Library. 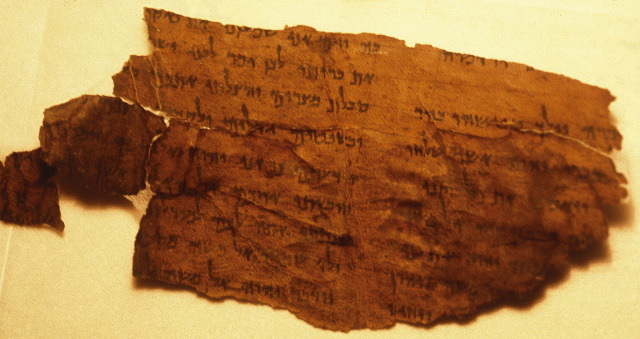 Women are conspicuously absent from many historical records, but the Cairo Genizah has preserved hundreds of documents that illuminate women's lives and experiences. For the last 40 years, Genizah scholars have worked to reconstruct the hidden 'World of Women' in Mediterranean Jewish communities. It is time to review this material and the progress made in understanding it. The lecture is free, but you need to register with eventbrite to attend. And follow either link for the details of the venue. For many, many past PaleoJudaica posts on the Cairo Geniza, see here, here, here, here, and just keep following those links. ANCIENT JEW REVIEW: Duke/UNC CLAS Symposium Report | De Malo: Evil and Theodicy in Late Antiquity (Taylor Ross and Nathan Tilley). Grafton relies on new evidence taken from Smith’s recently published correspondence with his life-long friend, the great Jewish scholar Gershom Scholem. These letters make it clear beyond any reasonable doubt that Smith could not have forged either Clement’s letter or the passages of “Secret Mark” contained therein. Actually, if you go to the link and read Grafton's essay on Stroumsa's book, you will see that Grafton doesn't quite say he thinks the case is made beyond reasonable doubt. Myself, I don't have a view either way on the genuineness of Clement's letter. I am unpersuaded by the efforts to decide the question by psychologizing what Morton Smith could or could not have done. Mind reading is an unreliable way to find the truth. In the absence of compelling evidence, I am inclined to give Smith the benefit of the doubt. The only way to determine whether the letter is a twentieth-century forgery is to find the manuscript again (or perhaps another manuscript) and do materials tests on it to determine when the letter was copied into it. That might work. Or it might not. And even if the letter itself is genuine, that doesn't mean that it quotes from an early, let alone the earliest, version of the Gospel of Mark. But I haven't put much effort into Secret Mark. You should pay more attention to the views of people who have. Tony Burke held a symposium on the subject in 2011, but all the links in past PaleoJudaica posts seem to go to dead ends in an old version of his blog. But there is some information here. See also here and here. And if you poke around in the archive of the current version of his Apocryphicity Blog, you will probably find more. Cross-file under New Testament Apocrypha Watch. TALMUD WATCH: Muslim country, Catholic country, Jewish country celebrate Talmud at UN. No joke. And principal Italian, Albanian and Israeli representatives of a remarkable project on a text almost entirely quoting men are all women (Ben Sales, JTA via Times of Israel). For more on the recent translation of the Babylonian Talmud into Italian, see here and links. ZWINGLIUS REDIVIVUS: The September Biblical Studies Carnival: A Learning Extravaganza At the Fair (Jim West). And Phil Long is still imploring volunteers to come forward for future carnivals. CHURCH SLAVONIC WATCH: Johannine Apocalyptica in Church Slavonic (Tony Burke, Apocryphicity Blog). Did you know that there's a sequel to the Book of Revelation? For past PaleoJudaica posts on (Old) Church Slavonic, see here, here, and here, and follow the links. Cross-file under New Testament Apocrypha Watch. NUMISMATICS: CoinWeek Ancient Coin Series: The Ptolemies: Part I (Mike Markowitz). The first in a three-part series. The Ptolemies, like the Seleucids, are important for the study of ancient Judaism. Both dynasties originated from generals (the Diadochoi, "Successors") of Alexander the Great who broke up and ruled his empire after his death. Ptolemy I is mentioned in the Book of Daniel (11:5), although not by name. There is a legend, as the article notes, that Ptolemy II Philadelphus commissioned the Greek translation of the Pentateuch (the Septuagint). He is mentioned for other reasons, again not by name, in Daniel 11:6. There are a great many Ptolemies, Berenices, and Cleopatras in this dynasty, but I think these two are the only ones who are featured on coins in this article. What is happening with the Iraqi Jewish archives? THE TIME IS UP: Fight Over Iraqi Jewish Archive (Breaking Israel News). This link leads to a recent video by i24News. It has some images of the newly discovered, flooded archives from 2003. And it interviews Dr. Harold Rhode, who has been involved since the discovery. It also points out that the deadline for the return of the archives to Iraq was September 2018, which has now passed. As the segment notes, there have been efforts at least to delay the return, and calls for the archive to be turned over to Israel instead. What has happened? Google is uninformative. Does anyone know? For past PaleoJudaica posts on the Iraqi Jewish archives, going back to their discovery in 2003, start here and follow the links. I have given some of my own thoughts on the situation at the links here. THE ANXIOUS BENCH: God’s Ambassadors. September 29 is the feast of Michael the Archangel, Michaelmas, and the feasts of Gabriel and Raphael are now celebrated on the same day. 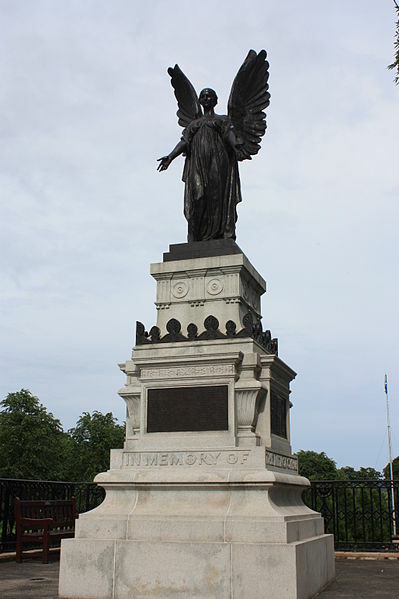 October 2 marks the celebration of the Guardian Angels. Sorry not to have noticed the Feast of the Archangels on Saturday. Saint Michael is somewhat of a celebrity in North-East Fife, Scotland, where I live. But today is the Feast Day for the Guardian Angels, so that will have to do for both. As usual, Philip Jenkins is on the case. Follow the first link above for a post on the archangels and their origins. ARCHAEOLOGY AND TECHNOLOGY WATCH: Secrets of a lost village of ancient Israel come to light. Technology such as LiDAR and a drone-mounted 4K camera have led to significant finds among layers of settlement spanning about 2,600 years (Abigail Klein Leichman, Israel21c.org). A vanished village, buried for centuries under the sands of time, is beginning to emerge in the cave-dotted lowlands southwest of Jerusalem. In typical old-new Israeli fashion, the work of revealing Beit Lehi-Beit Loya mixes painstaking manual labor with cutting-edge technology. Project leaders are now putting their fascinating discoveries on view to the public online in 3D, enlivened by virtual reality. This article and the associated YouTube video give a good overview of the discoveries at the site. I noted an earlier article on it here. Christian Origins and the Establishment of the Early Jesus Movement explores the events, people, and writings surrounding the founding of the early Jesus movement in the mid to late first century. The essays are divided into four parts, focused upon the movement’s formation, the production of its early Gospels, description of the Jesus movement itself, and the Jewish mission and its literature. This collection of essays includes chapters by a global cast of scholars from a variety of methodological and critical viewpoints, and continues the important Early Christianity in its Hellenistic Context series. We found one other new thing at Vindolanda, but I'm not going to post on it until later this summer. The reason why will become clear then. 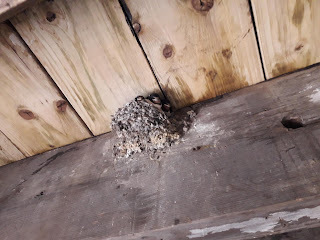 That's right, it's a swallow's nest with baby birds. Apparently swallows can raise two or three broods in a season, so this may have been round two. 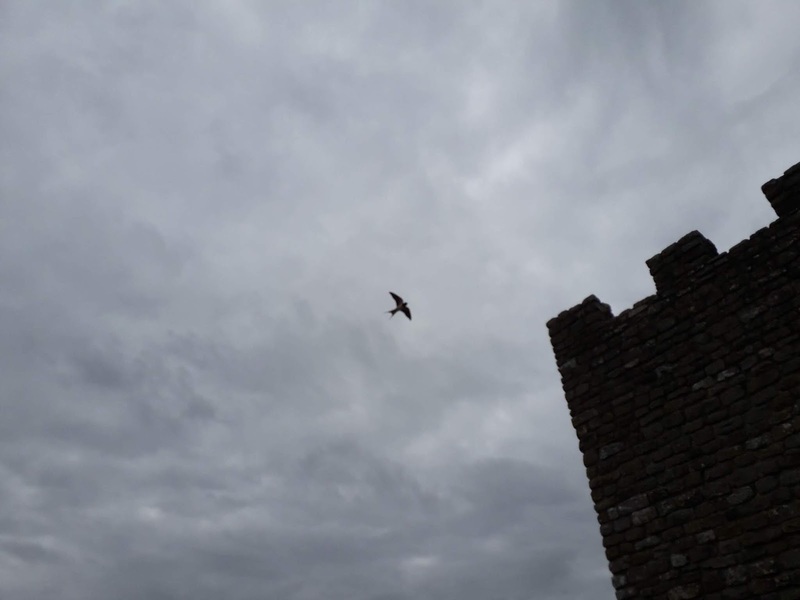 The nest was in the rafters of the ground floor of the reconstructed tower. This room has a lot of visitors passing through it. I don't know what the mother bird was thinking when she put it there. I can only conjecture that she built it before the tourist season started up. Once it started, she had her hands (wings?) full. She spent her time flying in and out and around the tower, trying to guard the nest from everything at once. I hope she succeeded. I withheld the photos because I didn't want to draw any additional attention to the nest during the tourist season. But by now all the babies have flown and the family has probably departed on their migration south. I hope she chooses a quieter site next year. I know what you are wondering. African or European swallows? It's a trick question. They are migratory birds that spend part of the year in both places. In July they were Europeans. About now they are heading back to Africa. The nest was the Vindolanda secret. I hope you enjoyed it. BIBLE HISTORY DAILY: James or Jacob in the Bible? Giving Jacob his due (Mark Wilson). For these reasons, changing English translations of James to Jacob makes a lot of sense. In my lifetime we have adapted to a number of name changes: Bombay to Mumbai, Peking to Beijing, Burma to Myanmar, and Rhodesia to Zimbabwe. These changes were soon incorporated by the media as well as in subsequent editions of geographical and historical books. Making such an onomastic adjustment need not be too difficult in religious circles, either. I acknowledge his points. But I like the name James too. THE OTTC BLOG: The Hazards of Paleographic Dating. This issue has been coming up a lot lately. In this post, Drew Longacre points out some similar problems with the paleography of manuscripts of the Hebrew Bible. Caveat paleographer! NOTHING NEW UNDER THE SUN: Present Trends in Textual Criticism … from 1962 (Peter Gurry, The ETC Blog). What is most interesting to me is some of the trends that Oliver points out are ones we think of as being definitive of our era and yet, Oliver sees them as trends in his. Last year's Shemini Atzeret post is here, with links. SO MUCH MALTA! The Weird Findings, Strange Artefacts And Archaeologic Gems Of Malta. And these barely scratch the surface (literally) (Chiara Micallef, Lovin Malta). This is the first I remember hearing the story of the Maltese giantess and her human lover. This appears to be a local legend. I don't know how old it is. I have just posted on the Maltese shipwreck here, with links, and on the catacombs of Malta here, with links. A past post on the Cippi of Melqart is here. Cross-file under Phoenician Watch. MORE MALTA: Channel Your Inner Tomb Raider In An Underwater Shipwreck This Saturday In Gozo. You can't say no to shipwrecks and Phoenician treasures (Chiara Micallef, Lovin Malta). This article is about the opening of the exhibition, which is already past. But it runs until the end of August, 2019, so it's not too late to see it. Follow the Heritage Malta link in the article for details. Past posts on the 7th century B.C.E. Gozo shipwreck are here and links. Cross-file under Phoenician Watch. FUNERARY ARCHITECTURE: Ancient Catacombs On Malta Reveal Christians, Jews, And Pagans Were Buried Together (Kristina Killgrove, Forbes). The iconography etc. of the tombs indicate that the catacombs have Punic, Christian, and Jewish burials from the Roman period into late antiquity. Past PaleoJudaica posts on the catacombs of Malta are here and links. Cross-file under Punic Watch.